Summer is a time when a lot of people find themselves consumed with counting calories and dropping pounds in order to feel confident, healthy — and achieve the perfect beach bod. But what about the other nine months of the year? Maintaining your health is something to be cognizant of every day of the year, especially for men, who, according to this infographic, tend to avoid check-ups and early warning signs for serious issues like heart attacks. Only half of men get the recommended amounts of physical activity, according to the Centers for Disease Control. Men’s Health Month is celebrated annually in June, aimed at increasing awareness of preventable health problems and encouraging early detection and treatment of disease among men and boys. 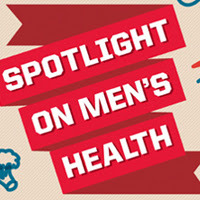 Presented by Nursing@Georgetown and Nursing License Map, this spotlight on men’s health offers some sobering statistics about where we are now, and ways in which we can all work to improve it. It also illustrates when and how often they should be tested for certain health issues. Seven million American men have not attended a physician’s appointment in more than 10 years. More than half of all premature deaths among men are preventable. The President’s Council on Fitness, Sports & Nutrition offers some tips to get the whole family involved in improving health. Set goals for physical activity and nutrition for the whole family. Youth are encouraged to be active for 60 minutes a day and adults for 30 minutes a day five days a week. Also, commit to one new healthy eating goal each week. Schedule time for fitness. After-dinner walks or a game of badminton are enough to get the family moving and working toward a healthier lifestyle — and help make fitness fun. Prepare meals in favor of going out to eat. Learn together as a family what it means to make healthy food choices, even for things as simple as fat-free or low-fat milk.